All our primed canvas is double primed with a white acid free acrylic gesso. FREE SHIPPING ON ORDERS OVER $99.00, except for exceptions on our shipping detail page. 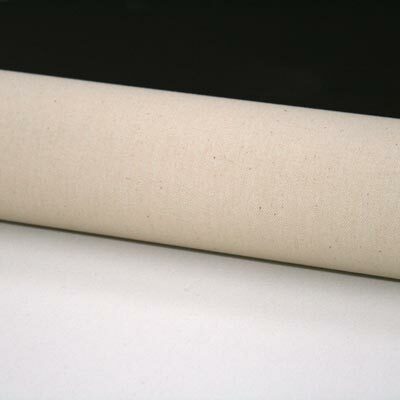 Double primed canvas on the roll at 84″ in width. The canvas is a #12 duck canvas before priming. It is coated with a high quality acid-free primer for excellent durability and performance. This product is sold by the roll. Double primed canvas on the roll at 84" in width. The canvas is a #12 duck canvas before priming. It is coated with a high quality acid-free primer for excellent durability and performance. This product is sold by the yard. TO ORDER A CUSTOM YARDAGE, ENTER THE DESIRED QUANTITY OF YARDS AND ADD TO CART. Double primed canvas on the roll at 72" in width. The canvas is 10oz before priming. It is coated with a high quality acid-free primer for excellent durability and performance. This product is sold by the roll. Double primed canvas on the roll at 72" in width. The canvas is 10oz before priming. It is coated with a high quality acid-free primer for excellent durability and performance. This product is sold by the yard. Double Primed canvas on the roll at 60" in width. The canvas is 7oz before priming. It is coated with a high quality acid-free primer for excellent durability and performance. This product is sold by the yard. TO ORDER A CUSTOM YARDAGE, ENTER THE DESIRED QUANTITY OF ROLLS AND ADD TO CART. Double Primed canvas on the roll at 60" in width. The canvas is 7oz before priming. It is coated with a high quality acid-free primer for excellent durability and performance. This product is sold by the roll. Double Primed canvas on the roll at 65" in width. The canvas is 7oz before priming. It is coated with a high quality acid-free primer for excellent durability and performance, with a smooth texture. This product is sold by the yard. Double Primed canvas on the roll at 65" in width. The canvas is 7oz before priming. It is coated with a high quality acid-free primer for excellent durability and performance, with a smooth texture. This product is sold by the roll.